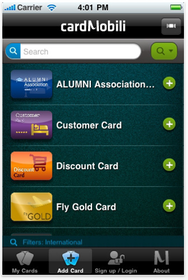 On Monday, Cardmobili launched its reward card app for the iPhone, iPod touch, and iPad in the U.S. App Store. The app, which has been tested in various international App Stores for several months already, lets customers store their membership cards for supermarkets, AAA, airlines, bookstores, casinos and the like on their iPhones, instead of needing to carry a whole stack of cards. The process in Cardmobili feels similar to adding new bills to your online banking account. The app has more than 300 loyalty card providers built-in; you simply find the vendor and tap in or scan the details from your existing card. If you can’t find your card in the app, though, you can still enter all its information manually, and your local vendor should be able to scan the card right from your iPhone’s screen. If your spouse uses an iPhone too, Cardmobili can sync your club cards via the cloud. When the app was initially launched in Portugal, it became the number one free application in the App Store there, according to Jeff Seabloom, the senior vice president of U.S. Operations for Cardmobili. Seabloom told Macworld that the company hopes to “replace the wallet” with its mobile app. Merchants who integrate with Cardmobili’s API can provide digital vouchers, coupons, and rewards within the app, Seabloom added. And since Cardmobili is location-aware, he said, the app can guide you to the nearest retail store. Seabloom expressed high hopes for the app’s social elements, too. A vendor could initiate a local promotion (“Come by our Palo Alto store today and get two pairs of shoes for the price of one!”), which customers could then post updates about (to Twitter and Facebook) to help spread the word. Cardmobili is free and requires iPhone OS 3.0 or later.